OK, that is your list of ingredients, what to do with them? You just have to heat up the stock, boil the egg noodles (nice and chewy is preferable), most of the cooking is with the wontons I guess. Put your pork mince in a bowl, take your egg (don’t know really, half an egg for about 150-200g of pork I reckon) and beat it a bit, and then throw it in with the mince and stir around a bit. If you have corn flour just put a bit on the prawns, then cut them (depending on the size into four parts if they’re small) and toss them in with the mince. Chop your spring onions, coriander, and chilli nice and fine to garnish your noodle soup with. Chop your shallot finely, I like to chop it in half vertically, and then slice it into smaller bits then. Heat up a pan (the smaller the better) with your canola oil, once hot, throw the sliced shallot in, and once they start to brown, turn the heat off, and let them cook in the heat of the pan, they should be brown and crispy at the end. Mix that around a bit, and then add a bit of salt and pepper, and stir it around evenly, add some soy sauce, you be the judge of how much you want, but don’t put much in, they really don’t need it, you can put salt in the water later to give the wontons a bit more saltiness if necessary. To make your wontons, take a wonton skin, place it on your bench, use a teaspoon to scoop up some mince making sure to get at least one piece of prawn in there and put in the centre of the skin. Folding/wrapping the wonton is a pretty simple task, my technique is just to fold the square in half (into a triangle shape), and then bring each corner toward the central corner and press down a bit to seal the wonton, it doesn’t have to be super tight. Throw a batch of wontons (about six (6) is a good number for one bowl) into the boiling water (turn this down to medium heat at this point), and then let the wontons cook, use a thingie to stir them to make sure they don’t stick to the bottom of the saucepan. If you find that the wontons aren’t salty enough you can add some salt to this water. I usually just watch the clock, five minutes at medium heat is a good amount of time to cook, but basically when the wontons float to the top of the water, they are done. Put your egg noodles into your bowl, splash on a bit of oyster sauce (how much depends on how salty your stock is and how much flavour/msg you like), I prefer putting the spring onions and coriander and chilli in before pouring the stock over the top, but this is not particularly important. I do like to put the fried shallots in after the stock because it means they stay crispy a bit longer. Put the wontons on top of the noodles (and add the char siu if you have it), and pour the boiling stock over the top, mix it around so that the oyster sauce is mixed in and flavoured. 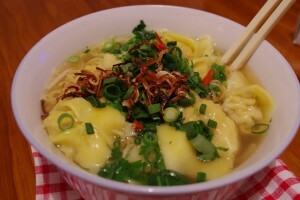 That’s it, you’ve got some yummy wonton noodle soup, I hope! Look at those yummy, fragrant fried shallots on top, yummy! 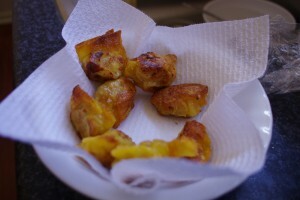 Update: Here’s a picture of the same wontons fried (pretty shallow), not particularly pretty, but they were pretty yummy too, with soy sauce, or if you have that sweet and sour sauce or similar, that’d be good too.